Everyone has heard of the Bermuda Triangle, what about the Vermont Triangle? Glastenbury Mountain VT and the surrounding area, that include Bennington, Woodford, Shaftsbury and Somerset. Also included in this mystery are the Ghost town of Fayville and Glastenbury. Glastenbury is a little town that was only in existence for about 103 years. The “official” Municipal history was from 1834 to 1937. People have lived in the area before and after the area having an “official” Municipality. The area that was Glastenbury is at a high altitude and very rough terrain according to (www.thisisvermontcom). Many people claim that the area is known to have UFO activity, Big Foot sightings, strange lights and sounds coming from Gastenbury Mountain. There were 2 known murders that happened in the area of the Mountain. What really stands out are that at least 7 people have gone missing from the area. 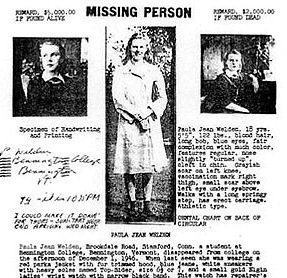 Middie Rivers November 12, 1945; Paula Weldon December 1, 1946, Jim Tedford December 1, 1949, Paul Jepson October 12, 1950, Frieda Langer October 28, 1950 (her body was the only body to be found), Martha Jones November 6, 1950 and Frances Christman December 3, 1950. Middie Rivers was in his late 70’s. Mr. Rivers was an active fisherman and hunter when he went missing. Paula was a young college student from a local college. Jim Tedford was a soldier and he is supposed to have disappeared from a crowded bus. No one could verify that Jim Tedford was actually on the bus. These are just a few examples of how different the people were that disappeared. Different authors have theories on what happened to the people. One theory is that because there were 2 towns that were on the Glastenbury Mountain maybe there was a well; that the victims fell into. Another was that there was a serial killer in the area at the time. Who really knows what happened to the people that disappeared. Could there a Bigfoot that is lurking in the woods that took the people away? Or was it aliens that came down from space that took the people? Strange things seem to be going on in the Southwestern portion of Vermont.